Of the many techniques for addressing the nasal tip, the tripod concept of nasal tip dynamics is one that has stood the test of time. This concept defines the conjoined medial crura as 1 leg of a tripod and each lateral crura as the other legs. The lengths of these legs can be adjusted to alter the tip position. The M-Arch model extends this concept to think of the tripod as an arch with a specific length that can be manipulated anywhere within the arch. Thus, length, projection, rotation, and lobule refinement can be achieved through technical maneuvers performed in a graduated and integrated approach. The M-Arch model also defines the domal arch, a lobular-arch consisting of the intermediate crura and anterior component of the lower lateral crus. A key component in making changes in length, projection, rotation, and lobule refinement is vertical division, specifically, making an incision in the tripod arch that is perpendicular to the long axis of the arch. Vertical divisions can also be used to alter columellar, lobular, and lower lateral crural deformities and change the position of the tip-defining point. The M-Arch model can be used to change tip projection. Increased tip projection is achieved by increasing tripod arch length anteriorly. Decreased tip projection is achieved by performing a vertical arch division and/or excision at the medial and lateral crural feet. The relative effect on projection and rotation is determined by the placement of the vertical lobule division. Counter-rotation of the tip-defining point occurs when the medial crura are shortened more than the lateral crura. If the reverse is performed, rotation is produced. Rotation shortens the nose; counterrotation lengthens it. With respect to lobule definition, vertical lobular division in the intermediate crus can be a significant tool to address deprojection, rotation, and lobular refinement. It is also useful in diminishing a hanging infratip lobule, narrowing a broad biconvex domal arch, and improving nostril-lobular relationship when the infratip lobule height is relatively large. Various other uses are possible. Ultimately, using the M-Arch model helps the surgeon produce the desired esthetically pleasing nasal tip. Surgically manipulating the nasal tip to achieve predictable results is the most difficult feature of rhinoplasty. One who can control the nasal tip is said to be able to master rhinoplasty. Anderson first proposed the rhinoplasty tripod theory. A complete comprehension of the tripod theory and the dynamics of tip projection, support, and rotation allow categorization of the different factors that may need alteration to manipulate the nasal tip. Rhinoplasty is technically demanding, and tip surgery is an art form. It requires an in-depth knowledge of the complex three-dimensional anatomy of the nose, a complete understanding of its physiology, familiarity with the described techniques of nasal tip surgery, and a well-developed sense of aesthetics; all are essential in mastering rhinoplasty. 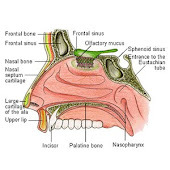 According to Tardy there are three major and six minor support mechanisms of nasal tip. Attachment of upper lateral cartilages (caudal border) to alar cartilages (cephalic border). This hypothesis proposes that fibrous connection between the upper and lower lateral cartilages play a vital role in the nasal tip support mechanism. This is in addition to the support structures suggested by Tardy. According to Wright this fibrous connection between the upper and lower lateral cartilages play a vital role in determining the nasal tip tripod structure.